No hunter will embark into an adventure in the forest without a hunting knife. A hunting knife can be used in a variety of situations. For instance, it is used in cutting the ropes, cleaning a fish, dressing a deer, or even defending yourself from potential attackers while you are out there and alone. Hence, allow us to present today, the top 10 best Benchmade hunting knives. 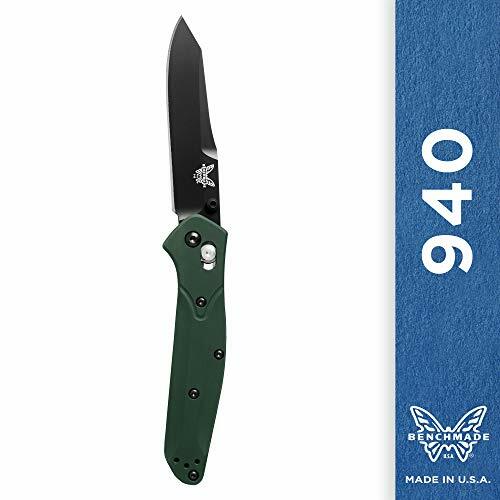 The Benchmade Hunt series is a series of knives specifically designed for both novice and expert hunter. Any hunter should own one of their knife series. Now we’re going to check each of their best-selling products—suitable to hunters of all levels. Allow us to introduce the Benchmade mini-barrage axis mini drop point folding knife! It is clad with a black Valox handle. It has a palin edge and a spring-assisted opening. Its AXIS assist locking mechanism provides additional safety features when you’re using the product. Also, its 154CM stainless steel blade allows you to do a variety of works while you are out in the woods. In just an affordable price, you can own a hunting knife that can scrape woods, cut the ropes, clean the fishes or even dress a deer. It comes with a reversible tip-up pocket clip for easy access. The blade length is 2.91 inches, and its overall length is 6.91 inches. 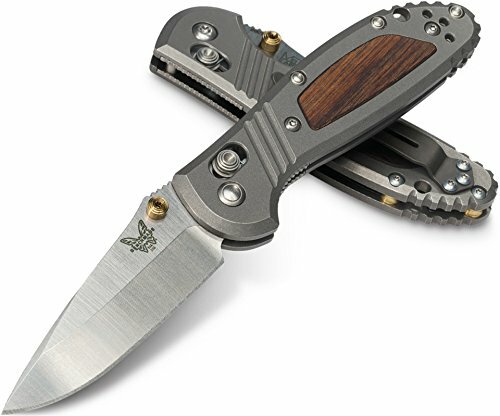 Introducing the solid Grizzly Creek folding knife by Benchmade. If you’ve spent years in hunting, it is natural for you to look for premium quality and heavy-duty products. Hence, we offer you this hunting knife that features a CPM steel drop-point blade for excellent edge retention. Rest assured that even if you use this hunting knife on scraping woods, it won’t chip at all. It’s also resistant to rusting and corrosion. 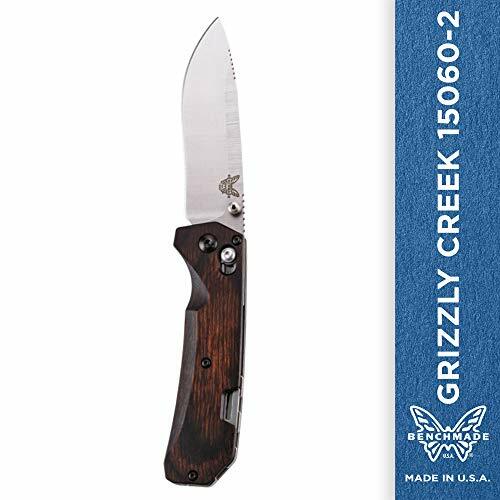 The Grizzly Creek has a folding gut hook with a jimped finger choil. Its primary spine has jimping in two places, allowing you to gain full control of your thumb and index finger when using the product. The dual thumb studs can provide a hassle-free opening system. Its Axis locking mechanism ensures your safety while using the product. In dressing deer or even cleaning a fish, this is the hunting knife that you should be carrying with you in the forest. We also have the Osborne Carbon Fiber non-serrated folding knife. This lightweight EDC knife features the ideal size and length of a blade for a variety of uses. It also has a reverse Tanto blade that features a sharp yet stout tip design that’s excellent for piercing while the thin fully belly slices are for the easiness of the product’s use. The blade is made of S90V stainless steel that does not corrode or rust over time. Its dual thumb studs will allow you to open the knife with just a single hand. 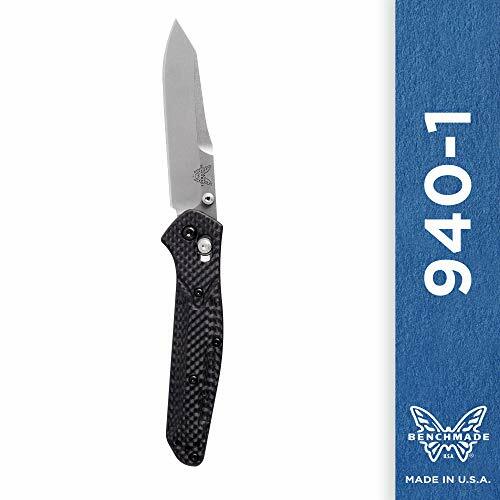 The Benchmade Axis locking mechanism, on the other hand, will ensure that it will never close in your hand while you’re still using the product. Its reversible steel pocket clip allows you to carry the hunting knife in a tip up position. This non-serrated reverse tanto blade features a unique titanium backspacer, the Benchmade Osborne Axis folder knife that provides premium performance right in your hands. It features a thin aluminum handle with natural curvature and contouring for optimal convenience while using the product. It also has a unique tread-like shape that allows you to gain full control when using the hunting knife. The knife’s liners also include a finger-tread cut in for maximized blade control. It also has a modified reverse tanto style blade made of durable S30V stainless steel and locks in place thanks to its ambidextrous blade lock. The package includes a carry clip as well. The length of the blade is 3 ½ inches while the overall length of the product is seven ¾ inches. 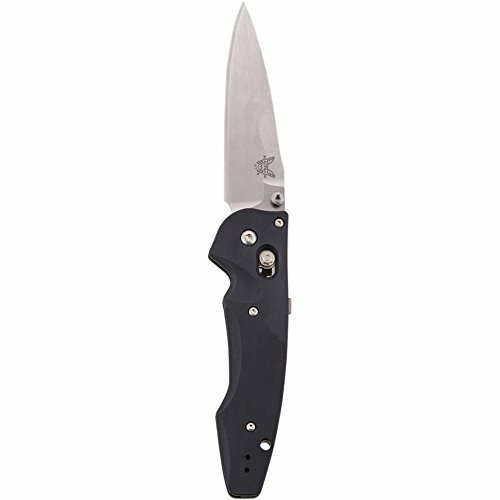 Check out this Benchmade mini griptilian knife. This knife is a lightweight knife that features a textured handle skin for superior and non-slip grip. It is also molded of Noryl GTX for added durability and strength. The hunting knife has a patented locking mechanism that provides safety to the user. It’s smooth and reliable, allowing you to do a variety of works while in the forest. Also, its 154CM stainless steel blade is released with a simple thumb rotation. This knife is ideal for novices in hunting. The natural curved design, stainless steel liners, and reversible steel carry-clip make this product more comfortable to use. The length of the blade is 2.91-inches while its overall length is 6 7/8 inches. 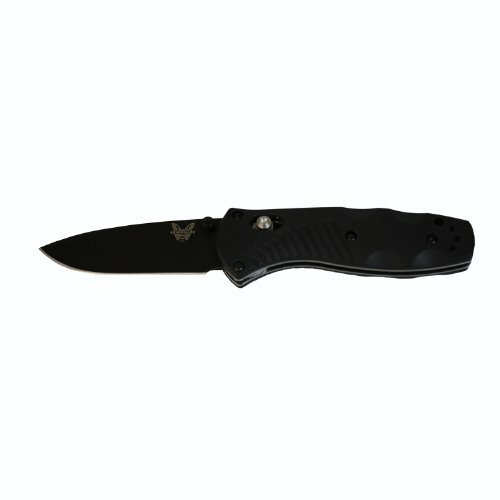 If you have extra budget, you might want to check out the Benchmade Emissary knife. It’s a lightweight hunting knife that features Axis assist opening system. The modified drop-point blade with ambidextrous thumb-stud opener is designed for the safety of the user. Also, its three-inch blade is made of premium stainless steel, for a Rockwell Hardness rating of 58-60 HRC. This hunting knife also features a CNC machined billet. Its high-strength aluminum alloy handle is designed to provide optimal comfort as well as its deep-carry tip-up pocket clip. The length of the blade is only three inches, and its overall length is 6.9 inches. If you are looking for a knife for your big game hunting, allow us to recommend this product to you. Introducing the Benchmade saddle mountain skinner. It features a modified clip-point blade at 4.17 inches. Its saddle mountain skinner features just the right shape and size of the blade. It is also excellent for edge retention that will never chip or corrode in the long run. Also, the knife will stay sharp even when you’re dressing several deer heads. The handle is made of Dymondwood laminate wood grips over a full tang construction. It’s ergonomically designed to ensure that it wouldn’t soak up any moisture or swell. For your convenience, it also includes a leather pressure-fit sheath. Rest assured that it wouldn’t create any unnecessary noise when you accidentally knocked it with other hunting weapons. 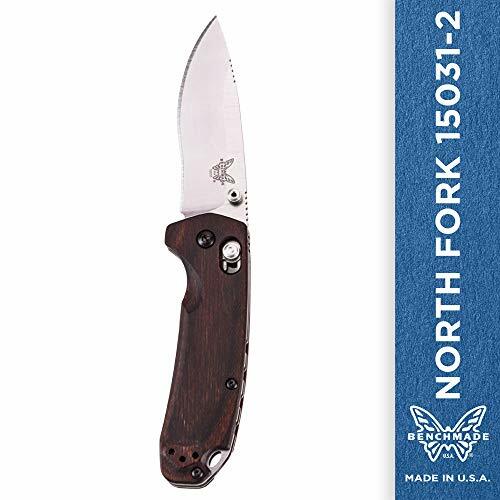 We also have the North Fork folding knife by Benchmade. It’s a practical all-around outdoor knife that’s designed to suit the hunter’s needs in mind. The drop-point blade is made of CPM-s30V premium stainless steel that’s perfect for retention. Rest assured that it can resist rust and corrosion in the long run. It also features an ergonomically-designed handle that allows you to do hunting works that require precision and intricate details. It is also suitable for cleaning small games or dressing big game. The Dymondwood laminate hardwood is comfortable to use and won’t absorb any moisture even when it’s wet. This hunting knife features the Axis locking mechanism that ensures you wouldn’t get injured in the middle of dressing a deer or cleaning a fish. The stainless steel clip is included in the package, allowing you to carry the product anywhere you want to go. 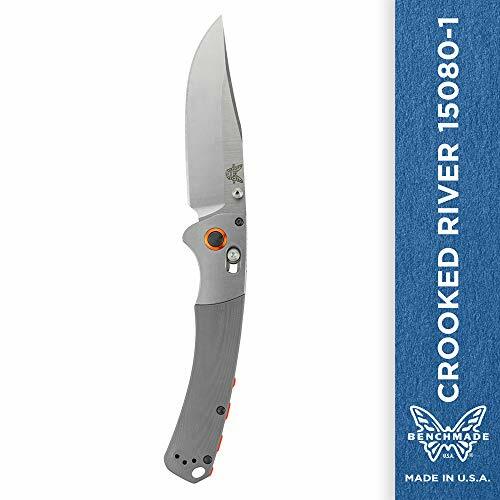 For our last product, we have the Benchmade crooked river folding knife. It features a long curving grip frame that’s made of stainless steel liners and anodized aluminum bolsters. The G10 panels ensure there is a balance in the hands. It also has a pronounced finger choil and back jimping to ensure that your hands won’t slide when you’re thrusting the knife down. This hunting knife features a four-inch clip point blade, making it a practical choice for all outdoor enthusiasts. The premium stainless steel blade allows you to use the hunting knife ruggedly without worrying about rust, corrosion, chipping, or cracking. Similar to all the products we’ve reviewed, it also features the Axis locking mechanism for your added safety.